A digital hash of the unrecognized process or file is created. These hashes are uploaded to the FLS to check whether the signature of the file is present on the latest databases. This database contains the latest, global black list of the signatures of all known malware and a white list of the signatures of the 'safe' files. The FLS checks detailed above are near instantaneous. (2) It will leverage Comodo's Cloud Scanning technology to determine whether the file behaves in a malicious fashion. Unrecognized files and applications will be isolated and run in the auto-sandbox. CIS will alert the user that it is going to run the application in the sandbox. 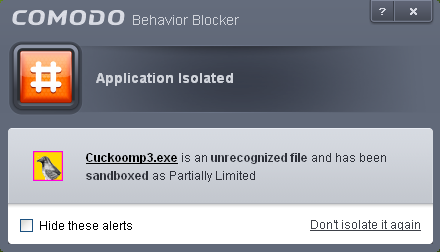 By defaullt, auto-sandboxed applications are run with 'Partially Limited' restrictions. Restricted - The application is allowed to access very few operating system resources. The application is not allowed to execute more than 10 processes at a time and is run with very limited access rights. Some applications, like computer games, may not work properly under this setting. Firstly, the files undergo another antivirus scan on our servers. If the scan discovers the file to be malicious (for example, heuristics discover it is a brand new variant) then it is designated as malware. This result is sent back to the local installation of CIS and the local and global black-list is updated. If the scan does not detect that the file is malicious then it passes onto the the next stage of inspection - behavior monitoring. The behavior analysis system is a cloud based service that is used to help determine whether a file exhibits malicious behavior. Once submitted to the system, the unknown executable will be automatically run in a virtual environment and all actions that it takes will be monitored. For example, processes spawned, files and registry key modifications, host state changes and network activity will be recorded. If these behaviors are found to be malicious then the signature of the executable is automatically added to the antivirus black list. If no malicious behavior is recorded then the file is placed into 'Unrecognized Files' and will be submitted to our technicians for further checks. Note: Behavior Analysis can identify malicious files and add to the global black list, but it cannot declare that a file is 'safe'. The status of 'safe' can only be given to a file after more in-depth checks by our technicians. In either case, the result is reported back to your CIS installation in approximately 15 minutes. If the executable was not found to be malicious then it will be run in the auto-sandbox. It will simultaneously be added to the 'Unrecognized Files' list and uploaded to our technicians for analysis. If it is discovered to be a threat then CIS will show an AV alert to the user. From this alert the user can opt to quarantine, clean (delete) or disinfect the malicious file. This new threat will be automatically added to the global black list database and therefore benefit all CIS users.